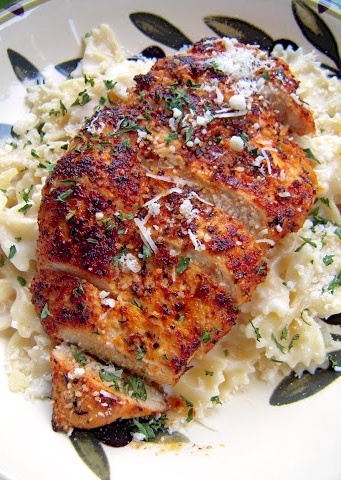 Blackened Chicken with Roasted Garlic Alfredo - so simple and SO delicious!! Chicken rubbed with cajun seasoning and pan seared. Serve over bowtie pasta tossed in roasted garlic and alfredo sauce. Better than any restaurant! Ready in under 20 minutes!! Pampered Chef came out with a new Creole seasoning this month and I was lucky enough to recieve a bottle from the consultant as a thank you for her baby shower cake. The first thing I thought about making with the seasoning was blacked chicken alfredo. I had some left-over roasted garlic from the roasted garlic potato bread, so I threw that in too. This was really good. The Creole seasoning had a great flavor but wasn't spicy. This was a really quick weeknight meal. Pound chicken breast to an even thickness. Drizzle olive oil over chicken breast to lightly coat. Sprinkle creole seasoing liberally over both sides of the chicken. Heat skillet on medium-high and add chicken. Cook 3 mintues on each side. While chicken is cooking heat alfredo sauce and roasted garlic. Add pasta and toss. Divide pasta between two pasta bowls. Thinly slice chicken and place on top of pasta. Sprinkle with parmesan cheese, if desired. I really need to learn to not browse food blogs before breakfast....I just end up being so hungry after looking at all this delicious food!